Oranjestad- Arubaanse Luchtvaartmaatschappij N.V, operating under the name Aruba Airlines, is the latest victim of issues caused by Venezuela, in this case the border closure ordered by President Maduro which has been lasting for over a month now. Aruba Airlines depends, for a great part, on traffic originating out of Venezuela with final destination Miami. Since the border closing, this is however no longer possible. The carrier in the meantime has stopped flights between Aruba and Miami in order to stem the losses, but has little alternatives to generate much needed income. Local media on Aruba reported last week that some employees were already being laid off, now that flights and thus cash flow have decreased considerably over past weeks. In what can be considered a perfect double whammy for the Aruban Carrier, the United States Department of Transportation (DOT) denied Aruba Airlines the right to fly charters out of Florida to Cuba; a potentially lucrative and much needed alternate source of income. The carrier appealed the DOT-decision, but on April 1, 2019 lost the case in higher appeal also. 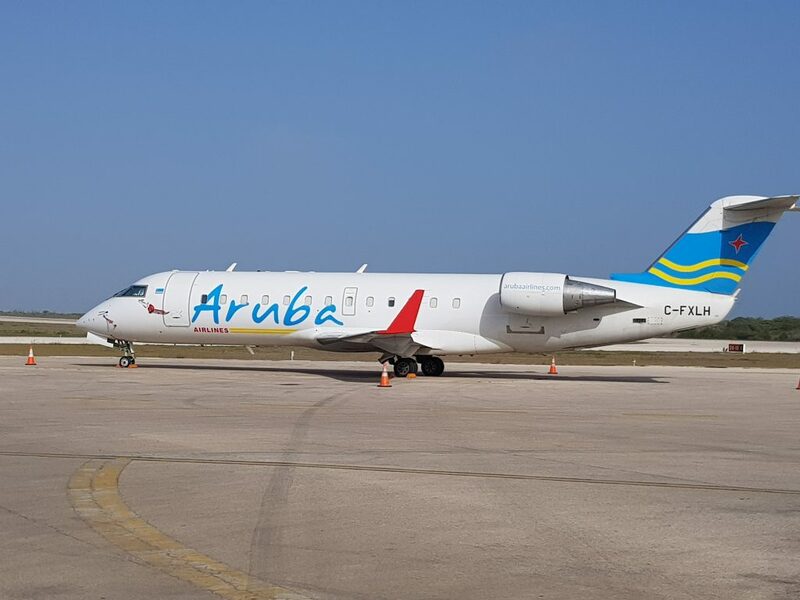 Aruba Airlines seems to be on a fast track to becoming the fifth Dutch Caribbean airline company to run into serious financial trouble, caused by the economical and political crisis in Venezuela. The same issues have in recent years already caused the bankruptcy of Tiara Air Aruba, Dutch Antilles Express (DAE), Insel Air Aruba and Insel Air International (Curaçao). Aruba Airlines is so far operating a fleet of 3 Airbus A320 airplanes and a 50-seater wet-leased Bombardier Regional Jet. The latter is used mainly for routes between Aruba, Curaçao and Bonaire, after the route to Punto Fijo also fell victim to the border closure. Airline experts are questioning the economical viability of the routes executed with the wet-leased jet, so that in fact, there are hardly any real alternatives to generate much needed income. It is cynical -and troubling at the same time- that all airlines mentioned above, including Aruba Airlines, have been able to expand due to demand out of Venezuela, but this fact also seems a prelude to their (possible) demise. The demand from Venezuela has caused these airlines to blindly focus on the troubled Latin America country, with little or no focus on alternate routes to operate, once the cash out of Venezuela dries up. Should Aruba Airlines not survive the current crisis, the islands will be left with 2 smaller carriers (Divi Divi Air and EZ Air), for transportation between the ABC-islands. Contrary to their bigger counter parts, both Divi Divi and EZ Air have been (much) more conservative in their expansion plans and have a bigger focus on the ABC islands, rather than on Venezuela. As of late, Sint Maarten-based Winair -in cooperation with their French Antilles based partner Air Antilles- have been expanding to include transportation to and from the ABC islands out of Sint Maarten and, within short, also to and from the Dominican Republic and Haiti. Although there are various carriers flying between Curaçao and the Dominican Republic, there are no longer any (direct) flights to Haiti since Haitian Carrier Sunrise pulled out of the Curaçao – Port-Au-Prince route. Winair is at present the only stable factor on the route between Curaçao and Sint Maarten, with Divi Divi struggling to also serve the route, initially in cooperation with Corendon Dutch Airlines and -as of this past week- by means of a wet-leased Fokker70 from Surinamese Carrier Fly Always. Turbines are only economical at high altitude and long distance not island hopping ABC’s. Dump the bombardier. And worse, in a wet lease construction which is very very expensive. The initial plan was for them to get a Dash 8 or Q400, but they never did. We at Puerto Rico haven’t had direct service to Aruba for a very long time. We need to visit our family and friends without the boring and troublesome SJU-MIA-AUA. We can be a good substitute. Now Aruba Airlines. Who’s next?